I see so many requests for airbrush makeup for weddings and I often wonder why Brides are asking for airbrush, what they have heard about it, what their experience with it is and why they’ve chosen it when regular powder, liquid and cream makeups are so readily available. I do offer airbrush makeup services however I personally believe that regular makeup is so versatile, readily available and offers a huge variety of tones, colours. formulas, and technology these days that you are guaranteed to find products to suit absolutely any skin type and desired look. I have also seen just so, so many terrible airbrush makeup disasters, with streaks and smears and blotches of colour that are cringe-worthy. But I do have my airbrush kit available for all brides to be but am selective as to who I use it on as it’s not for everyone. So I’ve decided to provide some further information about airbrush makeup and let you decide which you would choose. Airbrush makeup is sprayed onto the skin as a light mist of product using an airbrush. An airbrush works through the process of nebulisation to create the fine mist of product. A small amount of a very thin makeup designed for air brush use is put into a chamber of a gun. When the machine is turned on and the gun trigger pulled, a light spray of makeup comes out of the gun in a fine mist. The fine mist of colour covers the skin and gives the appearance of a flawless complexion. 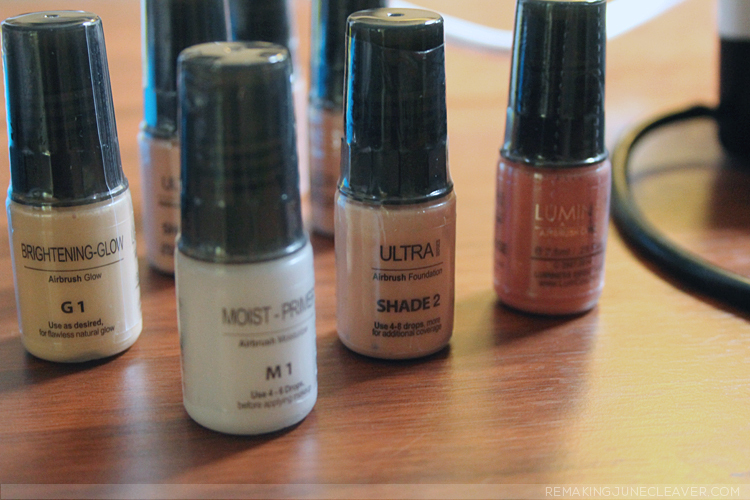 Foundation colours can be mixed for a perfect blend to match your skin tone. As the makeup is sprayed on, it connects with the skin as millions of droplets of formula. Since it’s such a fine mist your true skin tone shows through which makes it look more natural and not so much caked on. What are the usual ingredients of airbrush makeup? Silicone-based: Uses silicone for longer lasting wear and without fading. Silicone-based can be thinned with certain types of formula additives, for lighter coverage. Why do makeup artists use airbrush makeup? If an artist is skilled with the airbrush application will be simple and relatively quick. Use of an airbrush saves on cleaning and sterilising of tools as the airbrush itself does not come into contact with anyone’s The airbrush is easy to clean and switch between colours of product. Most airbrush systems are light and very portable. Most artists will have an airbrush however as a component of their makeup kit. Often it is used over the top of regular makeup to give that final flawless touch as due to the thin texture and lightness of the application it cannot be used to assist with smoothing the texture of your skin. When is airbrush makeup most suitable? Airbrush makeup is most popular in the film and photography industry where there is an artist on stand by to touch up as required. It’s also best to use when the skin it is applied to is already in pretty great condition, just because of how thin the product is, and should never be applied heavily. As airbrush makeup is not 100% waterproof its is not advisable to use it for event like weddings or dance concerts and eisteddfods. Unless the work underneath has been put in, as it is not guaranteed to resist sweat and tears. Airbrush makeup gives you an absolutely flawless finish. The correct application of makeup for your own personal needs is more important. It’s much more important that you hire a great artist than an artist solely based on if they airbrush or not. We cannot change the texture of your skin – only Photo Shop can. Well, there are a few makeup lines that are water-resistant, but it has nothing to do with weather or not is comes out of an airbrush gun. And, when makeup is water-resistant, it comes with it’s own set of problems. No. Its too thin to be used as a foundation for acne, scarring, fine lines, wrinkles, or dry skin. At best, it may be used as a fine finish on top of a traditional foundation simply to give it a finer finish once most of the work has been done. And by work, I mean that I would down an entire face full of foundation and concealer, giving you a flawless look long before the start button on my compressor is pushed. You’ll find most well-respected celebrity makeup artists use traditional makeup, because it is more precise. Traditional foundation is more opaque, and has a richer coverage. I can work the product into skin that may have some texture issues, filling in all the nooks and crannys. It allows me to be more involved, more detailed, because I don’t have to worry about ruining a finish since the finish is largely contingent upon my skill as an artist and not a machine. Not to mention, traditional foundation is more flexible when it comes to building up or sheering out coverage, which gives the me more control over the final outcome. With many professional brands offering silicone based formula’s, the durability of a traditional foundation is more water-resistant rather than water proof, but it looks, acts, and feels more like skin. It will still take patience and a makeup wipe to remove, but not an intense scrubbing. For those wanting a water-proof application, keep this in mind: Makeup that is best water-resistant is not super dry, it’s actually still got some viscosity to it. The water beads up on the skin, as opposed to re-wetting it, kind of the way a freshly waxed car would bead up against the rain. For live engagements, like your wedding day, silicone based traditional makeup or hand-applied airbrush formula’s are definitely preferred method, for control and precision. 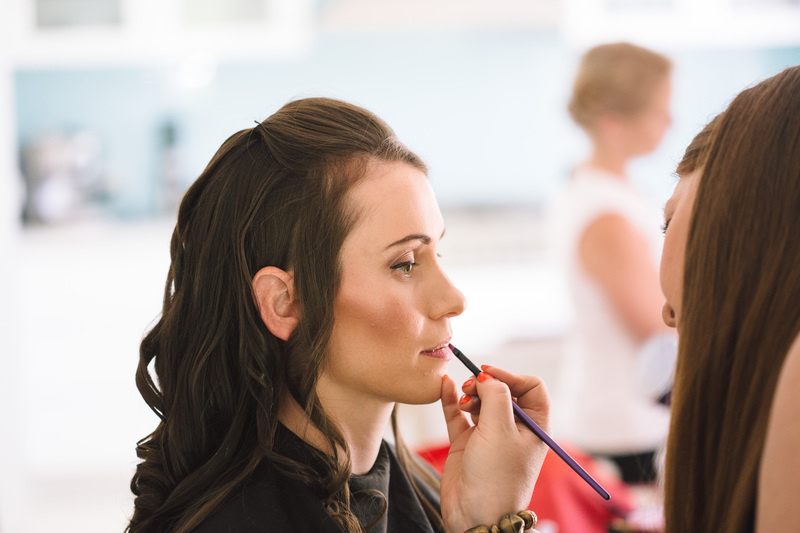 Would you have airbrush makeup or traditional makeup for your wedding day?